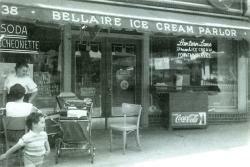 "This is the Bellaire Ice Cream Parlor/Luncheonette. It was owned by my father, Harry Sokol, and my grandfather, Tom Waxman. The address is 82-34 Lefferts Boulevard between Metropolitan Avenue and Abingdon Road. 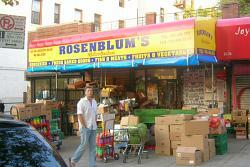 The site is where Rosenblum's Kosher Market is. Pictured here is me, Ronni Sokol, at age 3-1/2, and in the carriage, unseen is my newborn brother, Jeff. The woman with her back to the camera is my mother, Sybil Sokol. We cannot identify the woman standing." Click on thumbnail to view photographs. I am sitting here reading all the archives and can't believe all the names that are coming up that I haven't thought about in years. I've attached some old pictures that I dug out. Click on thumbnail to read the poem. Here is a poem I wrote today. I hope you enjoy it. Kew Gardens was my home for 26 years. I am glad I can still go home now and then. Editor's Note: I really need your help on this one. I am trying to locate the following people who lived in Kew Gardens during the 1960's. If anyone knows where they are or how to contact them, please let me know. 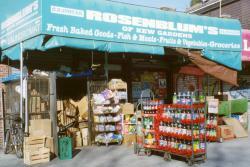 Editor's Note: Thanks to Carol Lacks for forwarding the following link to a web site featuring photographs of present day 83rd Avenue and Lefferts Boulevard. Happy Valentine's Day - The CANDY is in the mail. I'm finally out of the hype of the Stupor Bowl - now to the important matters. Sabo - great talking to you and thanks for sending in the picture of the Roomates. I remember when they would come up to the park and hit harmony and their were other groups that would showcase their stuff - sort of a battle of the groups. I don't remember Felix's last name he was a few years older than us, was married and a think had a child. 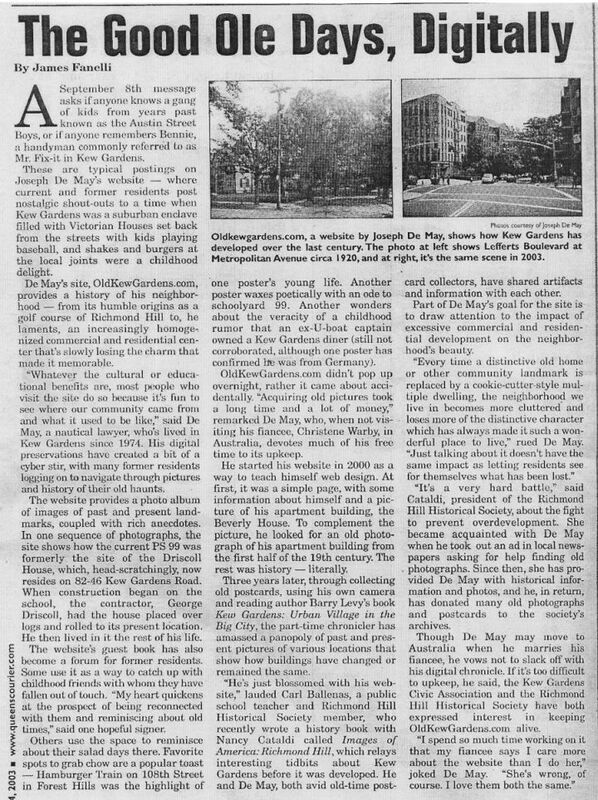 - he lived across the street from our apartment house - the Alt Green Towers on Metropolitan Avenue. I believe before they recorded those songs - they were a background group for Kathy Jean and recorded a real popular song - Please Love Me Forever - perfect for Valentine's. - If I am mistaken - let's hear from Doo Wop Jack. Growing up in the Fifties, especially in Kew Gardens was a Happy Time. We sang because we were Happy. The apartment houses all had great acoustics - we all sounded good - John D, Danny, Bobby Fox, etc - singing falsetto seemed to come easy - I think it had something to do with the clothes - I remember having worn purple velvet pants with saddle stitches with an inside zipper at mid-calf - you would think that they poured us into the pants - now if that did'nt make us hit High C - nothing would. Listening to the sounds of the 50's the great male and female groups - the harmony - the lyrics were positive, uplifting, and meaningful - ( ie: Rama Lama Ding Dong and a British Singer - Lonnie Donnegan's "Does your chewing gum lose its flavor on the bedpost overnight). I had inadvertenly accumulated a large collection of 45's from the girls who always threw parties in their finished basements of their homes - if you can identify the song, the group, the Label and the date of the party and send a self-addressed envelope - the Vinyl will be in the mail with your candy. Anyone who has names and dates of friends or family from Kew Gardens that passed away, please send the names of Linda Widder Wiesner so that we can compile a list and post it on the Kew Site. Am working on a memorial page with those who were born from 1935 to 1945. Any suggestions will be gratefully appreciated. Would also send the list to the company that is making the movie about Kew. I found an old picture of the Roomates.They were a local singing group from the late 50's and early 60's.Three of the four members were from Kew Gardens. From left to right: Steve Radin, Felix ,Bob Minsky and Jack Carlson.They recorded The Glory of Love, Band Of Gold and Making Believe. Steve was not from Kew Gardens. Funny how coincidences happen. I was just recently thinking of all the classmates that I attended '99' with who I understand have died (I would name them here but I think it would be inappropriate without family substantiation and permission). However, Linda Wiesner's idea for some type of memorial page is excellent if a way can be found to do so in the least offensive manner. I think it would be incumbant upon someone close to a decedent to make such an anouncement. A permanent record of those who have left us is an important part of the history of Old Kew Gardens. I was very sorry to find out that many of my old friends have gone. How about a Memorial Page for all those who were born in the 40's and have passed away. This seems to be the bulk of people who are on the site and I am sure they would want to know what has happened to many of their old frineds. Editor's Note: Linda, I will put together any kind of a page you or anyone else want. Just send me the content and let me know your preferences, if any, as to how it should be organized. Eve Harris, (now Celsi) p.s.99 class of '75. I lived in Kew Gardens from 1963- 1984. Now living in Oregon and waxing sentimental about "Mr. B's", with it's fine coin op horse, "Mildred Rogers School of Dance", the fabulous Austin Bookshop and the short lived, but inspiring (for me at least) Rock and Mineral shop off the corner of Lefferts and Austin. Wondering about Randi Zimmerman, Jason Liebowitz, Lisa Guggenheim, and any other classmates and/ or neighbors from the Roger Williams. I'm still in close touch with my best friend from kindergarten Janice Sloane. K.G. truly has a magic about it! Love that this site exists! Everyone in the photo lived in Kew Gardens.The photo is from a JHS 190 class trip to Tarrytown, NY. The picture was taken in front of the Rip Van Winkle Lodge on April 25,1955. Pictured are-----left to right----Daniel Lehrman, Leonard Kurtzweil, Jeff Kosiver, Jay Kaltman, Mark Fried and Barry Tobias. Editor's Note: The Queens Borough President's office is looking for someone to serve a four year term as the next Poet Laureate of Queens. I used to live in the building at the corner of talbot and lefferts. I dont recall the address but I wondered if anyone knew if the building had a name etc. I didn't get to graduate from p.s 99 being that we moved before I could finish. I found the site through forgottenny.com. The following link is to a story about Kevin Klauber, my buddy who lived at Kew Hall on Talbot St.
His story is a courageous fight to survive. One that shows the strength obtained from growing up in Kew Gardens. Although I am 17 years older than Ron Issaac we certainly share the same memories of Razzlers, King George, Mimi, Wonderland, etc. and I remember your house!!! !I lived in the Alt Green Towers from 1942-1953. I also go to the Kew Gardens movie theater at least once a week and although I do not think I look 90, the guy there also asked me for ID. I thought at first he was flattering me but when the man behind me asked for a ticket he asked him if he was a Senior Citizen and the guy said he was only 58!